trash: Install a program from your heap (paying the install cost). 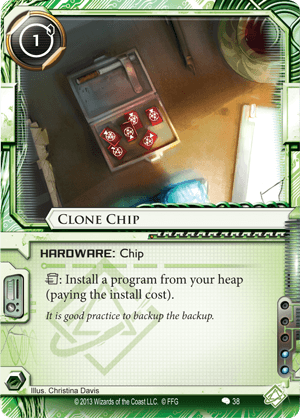 Clone Chip is one of the most powerful and flexible runner cards in the game. We see it in almost every Shaper deck, and is one of the most popular splashes in many Anarch decks too. FFG have recognised its power and ubiquity and added it to Most Wanted List as of Feb 1st, 2016. The first thing to understand about Clone Chip is its ability can be used in any paid ability window, of which there are many on both players turns, and during a run. One of the important paid ability window is Timing Structure of a Run step 2.3, immediately after an approached ice has been rezzed, but before you encounter it. If there is a breaker or program that you can use to handle that ice in your heap, you can go fetch it immediately and use it in that encounter. So if you hit a powerful destroyer such as Archer, Sharpshooter or Faerie will handle it, or for a dangerous AP ice like Komainu, Deus X can beat it. If you encounter any 0-strength ice (or low strength plus you have some Datasucker tokens) then a Parasite can destroy the ice before you ever encounter it. All of these cards are great with Clone Chip because they end up in your heap after their first use. They're not the only programs you might install with Clone Chip mid-run though. A popular trick is to combine Clone Chip with its tutoring counter-part, Self-modifying Code (SMC), which can find any of those same cards you need if they are still in your stack (deck) instead of your heap. You can do this if there is a SMC in your heap and you have 2 MU spare - in the middle of a run you can use Clone Chip to fetch and install the SMC from your heap, then immediately trigger the SMC to go get the program you really want from your stack and install it. You can also install your normal breakers via the above SMC trick or just if they happen to be in your heap. You might deliberately over draw cards on your turn and discard a breaker to set this up, especially for situational breakers like Atman, Cyber-Cypher or Femme Fatale that you want to target a specific ice with. Clone Chip is also potent anti-destroyer tech in that your normal breakers may be in your heap if the Corp managed to trash them, and Clone Chip makes it easy to get them back. Another place Clone Chip excels is with limited used programs like Cerberus "Lady" H1 and D4v1d, both of which are exceptionally powerful. The only catch is that once these programs use up their power counters they need to be trashed ready for Clone Chip to target them, but programs may be trashed voluntarily when installing any other program so this can usually be arranged fairly easily. As if all this wasn't enough, there is another paid ability window that is important for Clone Chip: Corporation Turn 2.2 after each click is spent. Against the ever-popular fast-advance strategy that seeks to install, advance and score agendas within a single Corp turn, a savvy runner can see the pattern and between the second and third click advancement ask the Corp to pause for the paid ability window and then go install a Clot to keep the agenda from being scored and then give the runner a chance to run in and steal it. Finally, I should mention that against Jinteki kill decks, Clone Chip is also great with Deus X to install it before any access (run step 4.3) when an advanced Project Junebug, Snare! or Psychic Field is suspected. Overall, Clone Chip is one of the key reasons to buy the deluxe box Creation & Control, and still worth serious consideration in any Shaper and many Anarch decks even with the extra influence cost from the NAPD Most Wanted List. This little thing is a failsafe in case you run into unavoidable program trashing provided by Corporate Troubleshooter used on scary Sentry ICE or Power Shutdown played after successful run. It can bring your program back, but it's most powerful when used to install software during the run. It works beautifully with Parasite, Deus X, Faerie or Sharpshooter, cheap programs that can be played almost every time and help you break thru ICE with suprising effects. Remember that when played during Stimhack, you can use that 9 to install things via Clone Chip. It's bread and butter of Shaper recursion magic, so use it.